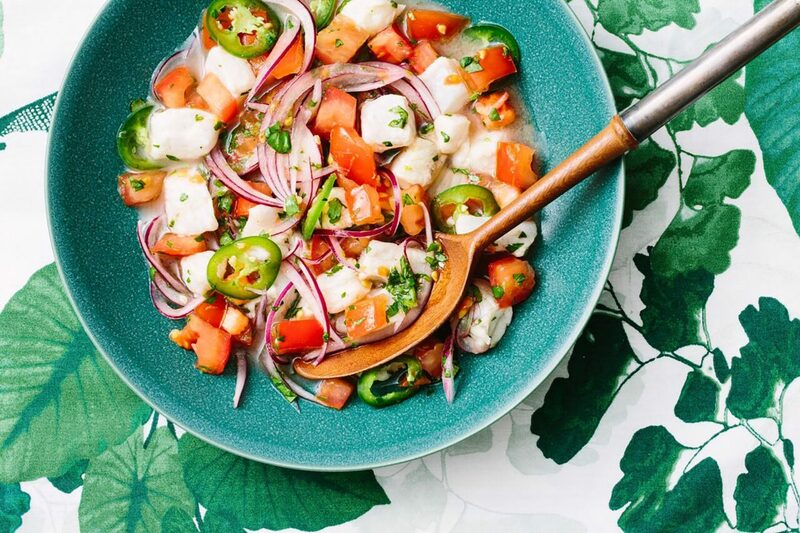 For the best ceviche, buy the freshest fish possible, ask your fishmonger to remove the skin or bones for you, store your fish on a bed of ice until you use it, and make this gluten free fish dish the day you buy the fish. Using a very sharp knife, trim and discard any leftover skin or dark parts from the fillets. Slice the fish into 1/2-inch cubes, transfer to a bowl, and refrigerate while prepping the rest of the ingredients. In a large, nonreactive bowl, combine the lime zest, lime juice, orange juice, tomato, red onion, jalapeño, garlic, cilantro, and salt. Toss to combine well. Add the fish, toss, then let sit for 10 to 20 minutes, tossing frequently and making sure the fish is covered by liquid. Garnish with cilantro and serve.